As in years past, the last Sunday in June is KalTour Day. 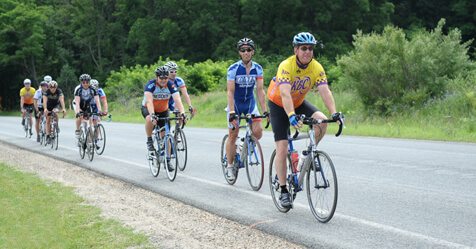 With routes for beginning and experienced cyclists, KBC’s KalTour, also known as Kalamazoo Scenic Bicycle Tour, provides opportunities to enjoy the scenic rural roads of the Kalamazoo County. This year’s KalTour, on June 24th, features all new routes and a new starting/ending point at Schoolcraft High School. Participants may choose from four routes: 15 miles, 31 miles, 62 miles (metric century), or a 100 mile (century). There will also be an option for a short, escorted family ride. All routes are marked with colored arrows painted at intersections, electronic maps will be available through Ride with GPS, and printed maps will be provided at check-in. Starting KalTour from Schoolcraft High School provides ready access to low-traffic and flat, rural roads. KalTour is a supported ride. Scheduled stops include access to restrooms, water and snacks. And lunch, provided by Erbelli’s, is available on each of the routes. Local bike shops provide mechanical support along the routes as well. This year’s century route will will guide cyclists “around Kalamazoo County,” stopping at Scotts Mill and Markin Glen County Parks as well as at the State Fish Hatchery. The 31 and 62 mile routes will also stop at Scotts Mill, while the family and 15 mile routes will have a rest stop at Prairie View County Park. KalTour opens at 7:00 a.m., registration is open until 11:00 a.m., and course support ends at 4:00 p.m. Cyclists riding the 100 mile route must depart by 8:30 AM; 62 mile riders must leave by 10:00 AM. Three group rides will be available: a fast 62 mile ride, led by the KBC race team, leaves at 9:00 AM; a moderately-paced 31 mile group leaves at 9:30 AM; and the escorted family ride leaves at 10:00 AM. Helmets are required at all KBC events. Headphones are prohibited while riding KalTour. Riders under 18 must be accompanied by a responsible adult. A portion of the proceeds from KalTour is donated by KBC to the Kalamazoo Valley Ambucs to help purchase adaptive tricycles and bicycles for children and adults with disabilities.